Seminar paper from the year 2009 in the subject Orientalism / Sinology - Chinese / China, grade: 2,0, The Chinese University of Hong Kong (-), language: English, abstract: The industrial revolution in Europe, or more precisely, in Britain changed the global economy substantially. Major changes in agriculture, manufacturing, mining and transport through technological innovations led to a shift of global economic dominance from China to Europe between the 18th and 19th century. Until that point, China has been the largest and most efficient market-economy in the world, leading in agriculture, transportation and innovations. Every major contribution that led to the industrial revolution in Europe was also prevalent in China, but still the country did not do the next step forward and was overhauled by Britain quickly. The objective of this paper is to examine the reasons why an industrial revolution did not occur in China during the Ming/Qing period, although it was the leading economy in the world. Therefore, the first section will shortly outline the economic development of China before the 14th century. 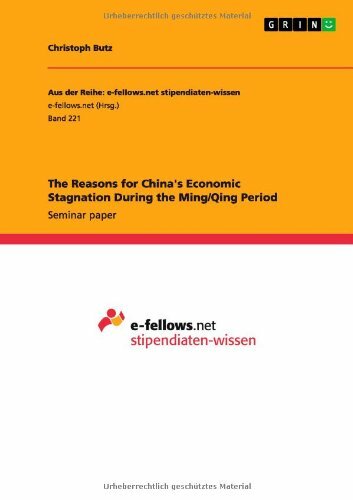 Thereafter, two different theories about the reasons for China's stagnation will be explained, before a critical evaluation of both theories will be provided. Last, a conclusion will summarize the main findings of this paper and give an outlook on future debates.